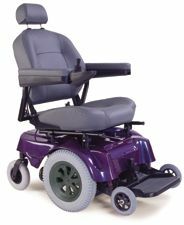 The Extra Wide Electric Reclining Wheelchair Model 2540 is specially engineered for larger patients that require a manual recline back to provide pressure relief and comfort. The manual recline system includes a hydraulic assist mechanism that allows recline angles from 90 degrees to 180 degrees. The extra heavy-duty frame and powerful electric system provide safety and durability for everyday use. High performance motors and programmable joystick control provide the ultimate in maneuverability. Seat Widths 22" or 24"
Hydraulic assist manual recline back from 90 degrees to 180 degrees. Front riggings Adjustable from 16" to 21"
20" x 2 1/8" cast aluminum rear wheels with pneumatic airless tires and puncture resistant tubes. Anti tippers and cam action, swing away legrests with roller bumpers. Integrated programmable controller with heavy duty right angle gear motor. 22" seat - 330 lbs. 24" seat - 380 lbs.